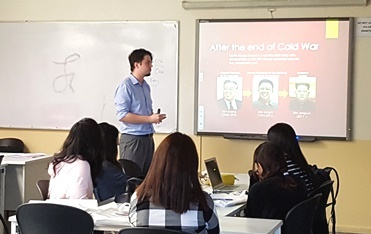 Dr. Marek W. Rutkowski, lecturer in global studies, gave a guest lecture for the students of Australian Matriculation (AUSMAT) programme on 28 March 2018 at Sunway University. Entitled “Seconds from Disaster? Donald Trump, Kim Jong-un and the Nuclear Bomb”, the lecture was set to explain the roots and global importance of the ongoing conflict in the Korean Peninsula. Elaborating on its genesis in the Cold War period, the lecturer pointed to the autocratic characteristics of the North Korean regime and the dire situation of the population. Noting that the current nuclear programme serves the purposes of the government, the lecture ended discussing opportunities and dangers of the announced upcoming Trump-Kim meeting in Pyongyang. At the end of the 45-minute session, the AUSMAT students had an opportunity to test their knowledge in a short quiz. They had no trouble answering the questions and three of them went home with prizes. 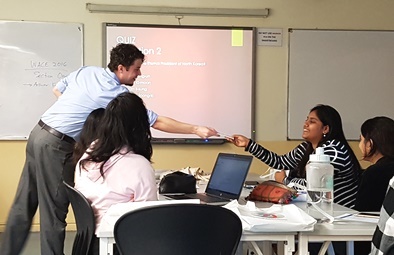 After the lecture’s conclusion, Dr. Rutkowski briefly explained the undergraduate course structure of the School of Arts and Social Sciences (SASS) at Monash University Malaysia. Focusing on the global studies major, he elaborated on the available units and career prospects awaiting future students.